Is it all a mind game? Unfortunately for anyone that lives on this planet, bad days are inevitable and practically a fact of life. It comes with the years and the pressures of growing up. But when those days come and we feel down and people just tell us to “Think positively,” it can sometimes be a pain in the behind. 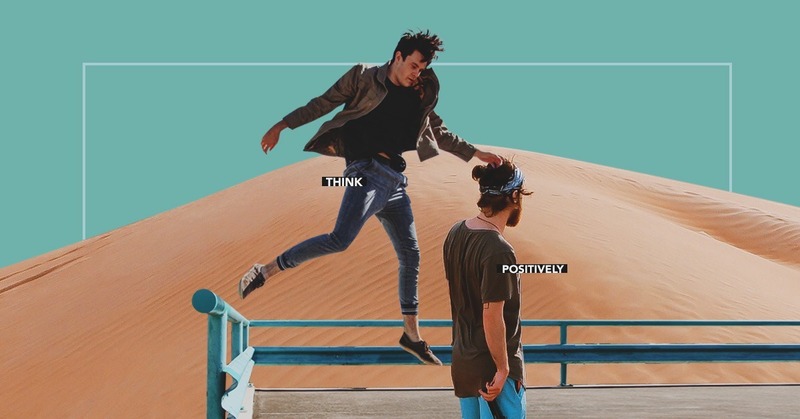 “Thinking positively” is easier said than done. The next time you hear that lovely piece of advice or hear yourself giving that same piece of wisdom, remember: There are actual ways to help yourself and the that’s speaking to you (you know, in a not so condescendingly vague manner). The power of music is amazing and it can help affect and alter your mood significantly. So on a day that you actually do feel like the sun is shining down on you and giving you the best light possible, let the mood flow and make yourself a playlist—it’ll come in handy when you’re feeling the opposite. Make sure to download that playlist too, in case the blues make a surprise visit and you’re still on your commute. Being a positive person is a conscious effort for most of us. Whenever those pesky negatives start to creep it, we need to do what we can to squash them. Remember: Positive people don’t have a perfect life; they just know how to grab on when they begin to spiral down. If you’re (understandably) having a little trouble changing your mindset, then change your body position instead. There are a lot of benefits that come with the right posture and a smile, like feeling powerful and positive! So make it easier on yourself and alter the physical, which will only help change your emotions too. So—okay—this might not be for everyone, but getting a pet can help us all find purpose. Taking a care of a dog that happily greets you at the end of the day can and will do wonders for your own happiness. And hey, if it means having something to do and someone to be with on the weekends, then so be it. We all get selfish when we’re feeling down, which makes it incredibly difficult to see beyond our own misfortunes. The thing is, looking at others can serve as a way out. Stepping out of our routing and helping someone else has the potential to change our perspective of the day. You’ll feel good about yourself and you can always smile at the thought of being someone’s hero for the day.